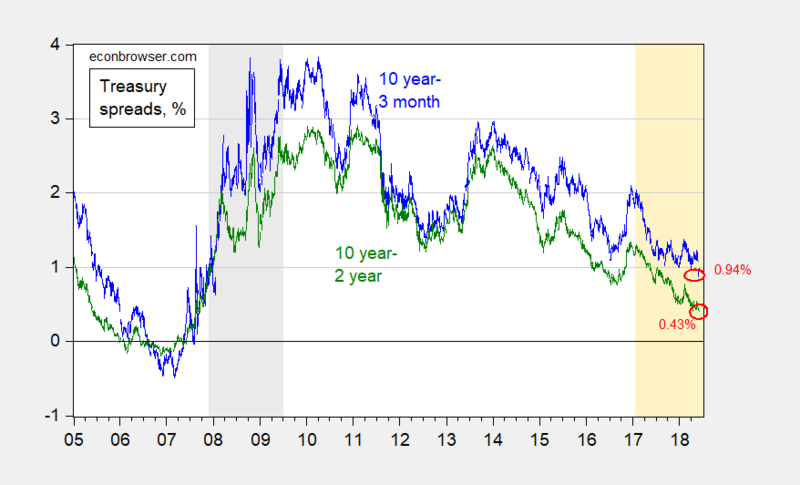 Figure 1: Ten year constant maturity Treasury minus three month Treasury bill yield spread on secondary market (blue), and ten year minus two year yield spread (green), both daily, %. Last observation is 6/1. Source: Federal Reserve via FRED, Bloomberg, and author’s calculations. The 10year-3month spread broke through 1%, to 0.9%, while the 10year-2year spread plumbed new depths, to 0.4%. As the graph indicates, the last time around in 2005, this event presaged the onset of a recession about 2 and a half years later. As I noted in an earlier post, about three of the six times that this has happened in US post-war history, a recession has not occurred. Was this a special event, driven by once-off factors? The spread dropped on 5/29 as the ten year dropped, likely because of safe haven effects. This point is highlighted by Figure 2, which shows the VIX against the spread. Figure 2: Ten year constant maturity Treasury minus three month Treasury bill yield spread on secondary market (blue, left scale), VIX (red, right scale). Source: Federal Reserve via FRED, Bloomberg, and author’s calculations. 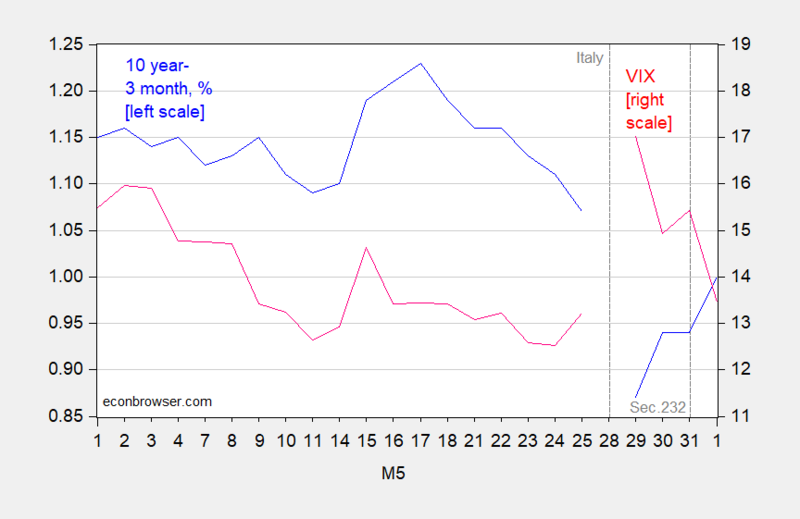 Note, however, that by 6/1 the VIX had returned to more normal levels, and yet the spread remained at 1%. In other words, the spreads continue their downward march. Using data through March and a formal model, the probability of a recession within of 12 months of March was 30%. Presumably for the 12 months from May, the probability is higher. This entry was posted on June 3, 2018 by Menzie Chinn. The spread I watch most since the Great Recession is the spread between interest rates on long-term (20 year) corporate bonds rated BBB and the interest rate on 20-year government bonds. The latter is 2.9% and the former is 4.8%. A 1.9% credit spread is relatively high. pgl: There is some interesting recent work here, using excess bond premium; see here and a survey here. Thanks for the links to this research on the “excess bond premium”. Krugman noted in a blog post that this idea dates back to Bernanke’s research on the Great Depression. The spread between long-term corporate bonds rated BBB and long-term government bond rates spiked in the early 1930’s as well. Does the FED committee look at the spread as a major consideration of a rate hike? Supposedly, the next meeting is baked in for a rate hike due to the strong economic report this month. Do you want the bland answer on that?? Or the more accurate/blunt “snarky” kind?? I’m a Democrat and “Not Trampis” has informed me Republicans on this blog are very sensitive (Almost maybe like “snowflakes”??) and your feelings are easily hurt. Does anyone know how we can provide virtual Kleenex to idiots who visit this blog?? How about some Crayolas?? Do you like Mattel Hot Wheels?? I used to have a stuffed toy panda bear when I was 5, does that strike you as calming?? This whole thing has affected me deeply, I had no idea things affected Republicans so harshly and I was hurting them at such a core level. I’m writing FOX News’s ombudsman and asking him if he can get the blonde anchors to talk in baby talk. This outrage has to stop somewhere. Maybe you Republicans like funny noises?? Here, think of this Youtube video as like a MAGA rally speech in Mobile Alabama, only here Trump is behind the camera, and the camera is on his audience. There are two questions I have right literally at this moment, which are more general economy related than to the curve or the inversion of the curve, although one could make the strong case the curve and economy are “intertwined”. How much of an effect would these tariffs have on GDP if the “orange menace” follows through on them??? And how quick do the effects occur?? What is the “lag time” for the tariffs to actually hit the GDP?? It sounds sick to hope for economic decline. And it is sick to hope for economic decline, but IF the tariffs are going to happen then it’s going to happen—and IF it’s inevitable the tariffs are going to happen (which isn’t 100% yet as far as I can tell, but I put it at 75%, which is way higher than I would have put it, say, back in January) then I want it to politically affect the same b*stard that enacted the tariffs. Yes—then I HOPE that the then inevitable effects happen sooner. As much as I am as a yield curve junkie I look to other things to see if all the ducks are lining up. The real feds rate is still negative wich tells me monetary policy is not tight yet. I know I am from down under but i simply cannot see the Fed putting up the feds rate to say 4 % in a year. PGL that is a good indicator. As far as I know, 3% has been the very much talked about ceiling. Certainly into 2020. Anyone is welcome to educate me if I got this wrong. Moses Herzog In their April 2018 economic outlook report the CBO projected a 3.7% average rate for 2019 and 4.1% average for 2020. That’s fair enough. And on many things budget related I respect the CBO. But I don’t know how many people quote the CBO on the Fed funds rate. But I don’t know how many people quote the CBO on the Fed funds rate. Just to be clear, the CBO forecast was for the 10 yr, not the Federal Funds Rate. No one expects the Federal Funds Rate to be anywhere near 3% by 2020. I believe that was MY WHOLE POINT. What The F**K do you think ceiling means?? And many people in fact do think it could reach 3%, I’d be very happy if Menzie wants to “ref” that one for us. Ever heard of the FOMC?? They are the ones who set the Fed Funds Rate. The year is on the X-axis. See if you can make out the 2020 year there. Not exactly a “no one” there. Moses Herzog You’re correct. I misunderstood you. I thought you were referring to the 10 yr. I’m having a hard time believing the FFR could hit 3% by 2020. Most FOMC participants (12 of 15) projected the fed funds target to be above 3% in 2020 via the March release. Your tone is a bit excessive for someone who claims the FOMC are the “the ones who set the Fed Funds Rate”. The FOMC sets the discount rate, interest on reserves, and overnight reverse repo rate. The latter two are used to support the FOMC’s fed funds target. So the FOMC uses rates they set in an attempt to hit their target range for the fed funds rate. Ergo, the FOMC does not “set the Fed Funds Rate”, counter your assertion. Semantics to some, alternative facts to another, misunderstanding to most. Everyone on this blog has long since figured out your game. Largely a know nothing, you lurk around to play “gotcha! !” but add zero substantive to this blog. If I move an object, and by moving that object I change where the shadow of the object falls, do I control the shadow of that object?? Why don’t you go argue that with some bum in your neighborhood and see if the two of you can figure that one out. I agree with you on the Fed Funds Rate not making it to 3% by early Jan 2020. I mean I’d put that probability at around 5–10% chance, probably closer to 5%. In other words, if there was a market bet which was like a binary event that it makes it to 3% or not, I would happily take the “not” part of that bet today. I’m obviously not that clever as far as reading the tea leaves, I’m just basing that largely on the fact SocGen and some other pretty sharp cats are saying as much–and it’s largely a consensus among that group. Certainly you understand the differences between setting a rate or not setting a rate. Even ignoring today’s monetary policy in the US and focusing on pre-great recession, the discount rate (set by Fed) and fed funds rate (targeted by Fed) are determined in different ways. In any case, there is quite a bit of discussion regarding the Fed’s “control” over interest rates as some regard the central bank’s influence rather transitory in nature. Bernanke once stated “The bottom line is that the state of the economy, not the Fed, ultimately determines the real rate of return attainable by savers and investors. The Fed influences market rates but not in an unconstrained way; if it seeks a healthy economy, then it must try to push market rates toward levels consistent with the underlying equilibrium rate.” Sumner also has a few blog posts on this. Reversing Operation Twist will steepen the yield curve. You are advocating higher long-term interest rates? Wow – advocating something that would lower investment demand. I guess your friends at Fox & Friends put you up to another dumb comment! How many little valleys will we go by, where Italian rates dramatically jump in a 24 hour period between now and September, where the idiots in the CNBC studio go “Well the rates have calmed down again folks, nothing to worry about now”. If the next Italy elections are in early September, that would be 3 full months correct?? June-July-August. 40 times?? 50 times?? And how long will it take for a significant chunk of that money to run to American bonds, and at least slow down the rate rise in America?? You have a large cross-section of Italians who have ZERO faith in the Eurozone, who are going to have an economic gun held up to the temple on the side of their head, the same as they did to Britain. Now when your average Italian person looks at what has happened to Britain thus far are they really going to get weak in the knees or piss their pants?? I tend to doubt it. And frankly, I’m not really sure they should. Of course the better comparison would actually be Greece. But what would have really happened in Greece had Tsipras listened to and followed Varoufakis’ advice to call the Troika’s bluff?? Would Greece have been worse off?? Unfortunately, Greeks will never know, because Tsipras could not find his own pair of, what did Madeleine Albright call them, “Cojones”?? Oh damn, I hope I didn’t offend any “conservatives” or Republicans with that last word. I know Republicans have a different standard for public dialogue when their quintessential model of class Mr Trump is inhabiting the White House. Now, can someone remind me, how did Devin Nunes say we do the 1940s style German salute again?? Olivier Blanchard nearly always worth a read. The probability of a recession within the next 9 months is 7%. Going out an extra 3 months to make a statement about a full 12 months ahead reduces confidence in your point estimate to near the vanishing point. That last three months is a killer. What happens to the confidence interval of your prediction starting at 9 months out and then going to 12? For those new to this, ask yourself what is the probability of a recession beginning in June? Answer. It would be on the order of 0.001%. That is because we already have data on key coincident indicators showing them at such a high level at the present that a one-month plunge into recession would be historically unprecedented. From near zero next month to twelve months out the probability of recession should monotonically rise. The crux of my point is that the sequence of confidence intervals will rise exponentially, and that there are very few economists in the country who have a data-only model in which there can be any real confidence as far ahead as a year, or of course beyond. JBH: Curious where you get your strangely precise estimates. In any case, this is the model. Usually I cite an estimate of whether the economy will be in a recession in 12 months, using a probit model. The NIESR estimate (as well as the FRBSF estimate) is cumulative, answering the question whether a recession starts 12 months out or less. Jeff Macke!?!?!?!?! Jeff Macke?? Is that you?? Jeff, your Mom is deeply worried about you. And your Dad has been hiding under his La-Z-Boy recliner deathly afraid the neighbors will ask him a question about you. The money is on its way by Western Union, along with a semi-large packet of methadone tablets by Federal Express. We have Father O’Doherty praying for you also. Go ahead and open that packet of methadone as soon as it arrives, ok?? Menzie: On the face of it, why would my 7% be any stranger than your 30%? The model itself was created in 1978, and revised only once since. The only recession it did not correctly predict in advance was the second leg of the dual 80-82 recessions. No false signals other than that miss. When the indicator is 3% (or more) off its cycle peak, a recession is immanent. March is the current cycle peak. The preliminary May number is .002 down from the top. (.002/.03)=7%. All recoveries correctly predicted in advance. No false signals over all these years. Though, as you know, the lead time at troughs is very short. Perhaps you could more clearly define what means in your response. Alternatively, according to your NIESR model what is the probability of a recession getting underway within 11months? Within 10 months? These we can then compare with your 30% which is cumulative for or over 12 months, whatever that means. Not bad, for an Aussie. An interesting point Grenville makes is that if we have another serious economic downturn, the Fed only has about 300 basis points (or 400 max?? Personally I don’t see it any higher than 3% clear into 2020) to play with on easing. Whereas, during the last crisis of roughly 2008 the Fed used over 500 basis points of adjustment or “easing”. I’m wondering if you could overlap these 3 into a graph what it would look like?? Or even somehow take the 3 of them together and turn it into an “index” number. If someone hasn’t already done this, I bet the results would be fascinating.